At the geographic center of the Outer Banks, Kill Devil Hills, NC (KDH as it’s known), is perfectly situated for those who want to see both the northern and southern ends of the Banks in one vacation. Kill Devil Hills, NC, is the largest town on the Outer Banks in terms of year-round population, and it offers a wealth of services, necessity businesses, shops, restaurants and fast-food places (locals lovingly call the Bypass through this part of KDH French Fry Alley). Kill Devils Hills is an Everyman sort of town. And, since it’s centrally located, most Outer Banks vacationers, regardless of where they’re staying, take advantage of something KDH has to offer, be that eateries, recreation, attractions or shopping. The things to do in Kill Devil Hills are varied and many. Surf shops offer rentals and lessons for any kind of board that floats. Fishing, whether in the sound, off a pier or in the ocean, is a popular activity. Add in kayaking, biking, 5K and other races, tennis and hiking in Nags Head Woods and you begin to see the variety of things to do in Kill Devil Hills. The Outer Banks Daredevils, a collegiate team, play summer baseball on the field at First Flight High School, there's a family recreation center with sports fields and playgrounds, a spa, a yoga studio, art galleries where you can take classes and lots more. Plus, Kill Devil Hills hosts a cinema with multiple screens – very popular on super hot or rainy days! Putt putt and speedways courses are fun alternatives too. Mother Ocean is the #1 attraction in Kill Devil Hills, as you might assume. Recent beach nourishment activity has widened the nearly 4 miles of beach, providing more room for sunning and playing as well as protection for the houses along the oceanfront. But the most well-known Kill Devil Hills attraction is a monument to powered flight. 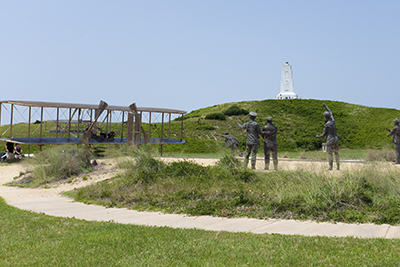 At the heart of the town is the National Park Service’s Wright Brothers National Memorial with exhibits and interpreters that help you learn the story of the beginning of aviation. Hiker and nature lovers will want to visit the Nags Head Woods Ecological Preserve, one of the most diverse maritime forests on the East Coast. Trails take you across ridges, up sand dunes and through woods that, even in the heat of summer, are shady and cool. Despite the name, the preserve is mostly located in Kill Devil Hills, though there are sections in Nags Head. There's a variety of Kill Devil Hills hotels, from older motel-type properties to resort hotels. Lots of these hotels are oceanfront, but there are also some on the Bypass or on the west side of the Beach Road, and these often offer smaller price tags. The town also has a soundfront campground and a couple of bed and breakfast inns. Most of these hotels offer WiFi connection, and some also provide a continental breakfast. Ask if your hotel participates with the YMCA for daily or weekly passes. For those who prefer to rent an entire house or condo, don’t overlook Kill Devil Hills as an Outer Banks vacation rental destination. The town features hundreds of rental homes to suit every taste and budget. Oceanfront mini-mansions rub shoulders with gracious older vacation homes, and interspersed throughout are affordable beach boxes and luxury condos. Put on your comfy shoes because you can be out all day shopping in Kill Devil Hills. While there are no malls, you'll find lots of strip centers filled with interesting, locally owned stores. Kill Devil Hills does have some national chains such as a Lowe's, Kmart, Publix, Food Lion and Harris Teeter, but the vast majority of the shops are unique to the Outer Banks. The reuse/rejuvenate trend is well-represented here, and you'll find some popular clothing and surf shops, galleries, pet supply stores, equipment rental places, jewelers, souvenir shops and home decor stores. Great ready for some good eating in Kill Devil Hills restaurants. It's a culinary tour: Caribbean, Southern, Pacific Rim, Thai, Mexican, Italian, BBQ, pizza, burgers, fresh seafood, steaks, oysters. And the style goes from flip flops and totally casual to refined. As with Nags Head restaurants, the busiest nights in the summer are Wednesday and Thursday. You can sometimes beat the crowds if you go early (4:30 or 5 p.m.); most do their last seating around 9 p.m. during the season. The majority of Kill Devil Hills restaurants don't accept reservations, but it's still a great idea to call ahead if you're trying to bring a large group and want to be seated together. Consider eating out for lunch because lots of these restaurants serve both lunch and dinner. How did Kill Devil Hills get its name? Most locals agree that the most plausible explanation for the town's name came from rum that would sometimes wash ashore from wrecked vessels that was so strong it could "kill the devil." What is the weather like in Kill Devil Hills? Kill Devil Hills gets an average of 51 inches of rain per year, with July being the rainiest month. 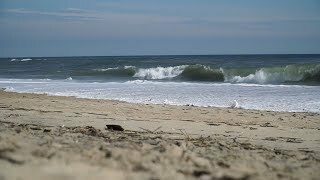 Where is Kill Devil Hills in relation to other Outer Banks towns? Kill Devil Hills is directly north of Nags Head and directly south of Kitty Hawk. If you're not a local, you probably won't realize when you've left one town and entered another since the town lines merge. KDH is a centrally located town on the northern Outer Banks (i.e., the towns north of Hatteras Island), making visits to Manteo or Corolla equally as easy. What are the drive times to other towns on the Outer Banks? We'll give these times with consideration for summer traffic. In the off-season, you can knock 5-10 minutes off. Where are the beach accesses and lifeguard stands in Kill Devil Hills? 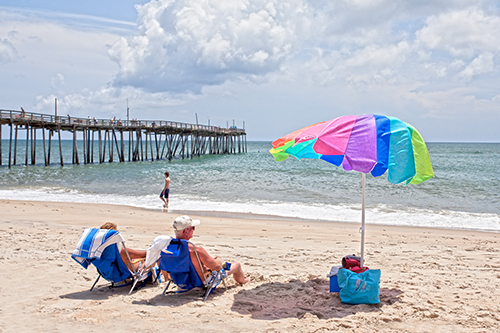 Kill Devil Hills makes getting to the beach very easy for visitors and locals with their 32 public beach accesses. Of those, 21 have a fixed lifeguard stand, one has a bathhouse and and 17 have showers and paved parking. If your house is close to an access without paved parking (and you want to drive to an access), just go north or south an access or two and you'll come to one with parking. On the Outer Banks, it's free to park and use all the public beach accesses, which is often a surprise to our visitors. Note that the currents and wave action on the Outer Banks ocean are often far more powerful than many visitors are used to, so it's always advisable to swim within sight of a lifeguard. If you don't know how to look out for rip currents, ask a guard and they'll happily teach you. Kill Devil Hills lifeguards are on duty from Memorial Day through Labor Day from 10 a.m. until 5:30 p.m. After Labor Day, guards patrol the beach on ATVs and in trucks until mid-October. Here are the fixed lifeguard stands, noted by milepost marker numbers running north to south.